Imphal, Mar 15 : Soon after Okram Ibobi Singh was sworn in as chief minister for his third term on Wednesday, the fight for his deputy came out in public. The Kuki-Paite bloc in Congress is unhappy with the party high command's move to appoint a Naga leader as the deputy chief minister. Sources say the Congress high command is in favour of appointing PCC chief Gaikhangam, a Naga tribesman, as the deputy CM to counter the Naga hard line politics played by Naga People's Front (NPF) and United Naga Council (UNC) as both are backed by NSCN (IM). The highest Kuki tribal body, the Kuki Inpi Manipur (KIM) has openly supported the seniormost tribal minister and former PCC chief Phungzathang Tonsing for the deputy CM's post. 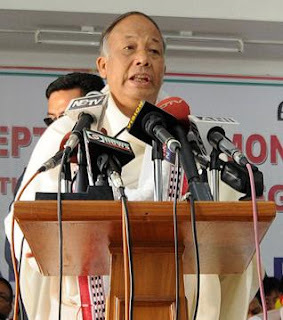 In a letter to AICC president Sonia Gandhi, KIM president Thangkhosei Haokip said the Congress in Manipur has neglected the political demands of the Kukis by following a Naga appeasement policy at their expense. He said, "Tonsing helped build the party during the NDA rule. He ensured 100 per cent success from Churachandpur district in the recently held election. Tonsing also enjoys the confidence of majority of the CLP members." He informed the AICC chief that the state government had only agreed in principle to create a Sadar Hills district but had not fulfilled it yet. "This has created a sense of mistrust and alienated Kukis from the Congress," Haokip said. Manipur had suffered a 121-day economic blockade last year over the issue of creation of Sadar Hills district. "Unlike Naga rebels who demand secession, the Kuki militant groups have entered a Suspension of Operations with the state government for a peaceful solution to our political demands. If the Congress continue to follow a blatant pro-Naga policy, it could be disastrous for the peace process," Haokip said. He hoped the Kukis' loyalty to Congress will be kept in mind while appointing the deputy CM. Haokip reminded the AICC chief that "in every Lok Sabha, assembly and district council elections, the Nagas under UNC and NPF with support from NSCN (IM) have been attacking Congress candidates and workers. On the contrary, Kukis have been staunch Congress loyalists and are an important support base of the party."